A new multimedia ebook contains previously unseen archive photography by Beatles drummer Ringo Starr. The ebook, Photograph, is available on iTunes, and contains 149 pages with over 100 images, 69 audio clips and 11 exclusive videos. The multi-touch ebook, priced at £9.99/$12.99/€11.99, is available from the iTunes book store, and allows readers to play with and zoom in on Starr's photographs. It accompanies the Grammy Museum exhibition, Ringo: Peace And Love, in Los Angeles, which also features images from Starr's personal archive. The exhibition opens today and will run until November 2013, before being taken around the world in 2014. Ringo: Peace And Love, the world's first major exhibition about the drummer's life, will feature photographs, letters, documents and artifacts, including Beatles-era drums, Starr's Sgt Pepper suit, his Help! cape and the coat he wore during the group's Apple rooftop concert. I was asked to archive all my "stuff" when the Grammy Museum in LA decided to do a Ringo exhibit. In the basement at home I found loads of my old clothes and costumes. But then, in a drawer, I found a whole album of negatives I'd totally forgotten about and another album of photos. My late mum, Elsie, had kept hundreds more, of me too – my childhood and early days making my name as a drummer in Liverpool. Going through them all was like a trip down memory lane – and that's how my ebook, came about. Published by Genesis Publications, Photograph includes archive pictures from Starr's childhood, Beatles years and beyond, accompanied by original text, audio and video descriptions. All the Beatles had cameras – I think we bought a whole load on our first tour of Japan – but I'd been snapping away for a while before that. 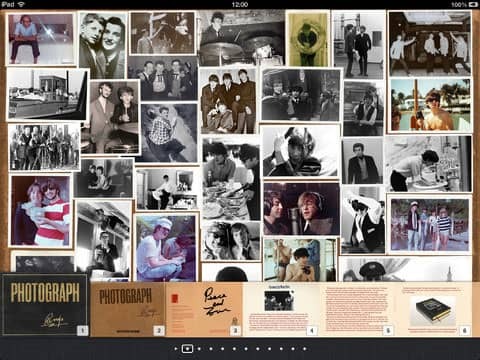 Millions and millions of pictures of the Beatles have been taken, and published, over the years. We always had a real photographer around us, like Dezo Hoffman and Bob Freeman who took a lot of photos of the Beatles for our album covers. But I took pictures of them photographing us – and I had a unique perspective of that incredible period of our lives. That's why my new ebook, Photograph, is so special. Because these are the shots that only I could have taken. I've captured John, Paul, George and myself in pensive and playful moments – eating, drinking, recording, relaxing, playing Monopoly and fooling around in hotel rooms. A limited-edition, hand bound book version of Photograph, limited to 2,500 copies and signed by Starr, will be published by Genesis in December 2013.